In 2017, energy consumption in Norway’s onshore industrial sector was 79 TWh. In comparison, total household energy consumption in the same year was 49 TWh. Energy demand in the industry is often in the form of thermal energy – steam, heat or hot water, and cooling. Thermal energy storage has a key role to play in enabling the greater use of renewable energy in the industrial sector, and will boost the utilisation of industrial waste heat. The research centre FME HighEFF (Centre for Energy Efficient and Competitive Industry for the Future) has recently published its annual report for 2018. Watch the video and view the results of last year’s activities here. The greater part of global steam and hot water production continues to be based on the use of fossil energy sources. Depending on temperature needs, cooling is achieved using either sea water or large cooling plants. The latter incur huge investment costs and can be operationally challenging under conditions of fluctuating demand. The industrial sector is highly motivated to reduce its emissions, and since the industry consists of a smaller number of large units, there is enormous potential for significant emissions reductions. Fossil-based steam production can be replaced by renewably-sourced electricity or concentrated solar power (CSP) systems, depending on location. In both cases, the availability and/or price of the thermal energy will vary. If the aim is low-cost and continuous production, there is one technology that can play a key role – thermal storage! Thermal storage research is being carried out at both high and low temperature levels at the FME HighEFF centre. In the field of Cold Thermal Energy Storage (CTES), a new technology based on the use of Phase Change Materials (PCMs) is being developed by Ph.D. student Håkon Selvnes, in collaboration with a local supplier Skala Fabrikk. CTES technology is ideal for application in the food industry, which has large and fluctuating cooling needs, and which wants to use renewable energy when prices are low. In the case of high-temperature thermal storage, new technologies will be needed for large-scale and cost-effective production and storage of steam. Alternatives include different types of phase change materials, or sensiblestorage media such as molten salt or concrete. In addition to selection of the right technology, efficient use of thermally-stored energy requires good design and effective control strategies. 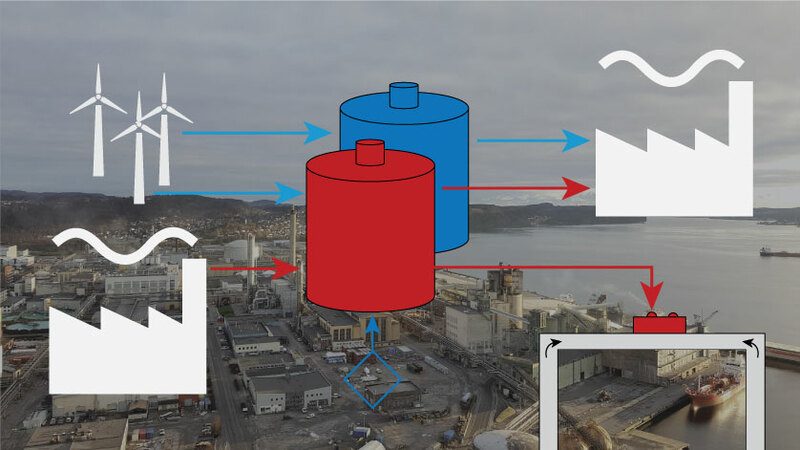 The use of advanced modelling tools has enabled researchers at the FME HighEFF centre to observe how thermal storage and advanced control strategies, such as predictive control, can be used to boost the exploitation of industrial waste heat. Energy storage is a key topic in the green transition debate, and thermal storage technologies will enable the cost-effective storage of large volumes of energy. We guarantee that you will be hearing more about thermal storage and effective control mechanisms in the years to come! Read more on SINTEF’s work on Phase Change Materials (PCMs).